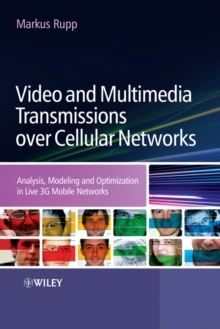 This excellent reference provides detailed analysis and optimization aspects of live 3G mobile communication networks Video and Multimedia Transmissions over Cellular Networks describes the state-of-the-art in the transmission of multimedia over cellular networks, evaluates the performance of the running system based on the measurements and monitoring of live networks, and finally presents concepts and methods for improving of the quality in such systems. Key Features: * Addresses the transmission of different media over cellular networks, with a focus on evolving UMTS transmission systems* Provides in-depth coverage of UMTS network architecture, and an overview of 3GPP video services* Describes the characteristics of the link layer errors in the UMTS Terrestrial radio Access Network (UTRAN), obtained by extensive measurements in live UMTS networks* Covers video encoding and decoding, introducing H.264/AVC video codec, as well as addressing various novel concepts for increased error resilience* Discusses the real-time capable algorithms that are suitable for implementation in power and size limited terminals* Presents the methods for monitoring quality, as well as analyzing and modelling traffic evolution in the cellular mobile network This book provides a valuable reference for researchers and students working in the field of multimedia transmission over wireless networks. Industry experts and professionals working within the field will also find this book of interest.